Just like your car needs oil to run well, your body needs vitamins to aide in necessary biochemical reactions. Vitamin deficiencies that exist for a prolonged time can lead to diseases that are quite serious. Vitamin deficiencies present as a variety of symptoms that can be easily overlooked until they turn into a more serious problem later on. 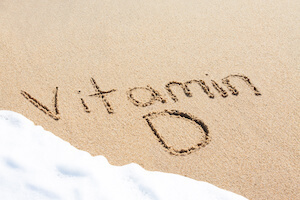 Vitamin D is an important vitamin for the human body. Healthy bones require optimal hormone levels (Testosterone, Progesterone, and Estrogen) plus optimal Vitamin D levels, trace minerals, and weight bearing exercises. Deficient Vitamin D can lead to osteoporosis (thinning bone). Low Vitamin D can also cause you to have a lowered immune system (increased susceptibility to illnesses), a depressed mood, and increased muscle aches. An increased risk for colon, breast, and prostate cancer has also been linked to Vitamin D deficiencies. Optimal Vitamin D blood levels (measured as Vitamin D 25 OH) are between 50 and 100 ug/L. Check your levels and detect deficiencies before they cause health problems. You can get Vitamin D by consuming fatty fish, eggs, butter, and vegetable oil. Sun exposure also gives your skin what it needs to make Vitamin D. A daily exposure to sun at half the time it takes you to burn should be adequate (no sunscreen). If you need to take a supplement, Vitamin D3 is the best form to take. Always take the supplement with fat containing food as it requires fat to be properly absorbed.